New research suggests that ailing people should be more pushy about getting follow-up care. WASHINGTON — No one wants to make a repeat visit to the emergency room for the same complaint, but new research suggests it’s more common than previously thought and, surprisingly, people frequently wind up at a different ER the second time around. Already some ERs are taking steps to find out why and try to prevent unnecessary returns. A Philadelphia hospital, for example, is beginning to test video calls and other steps to link discharged patients to primary care. The new research, based on records in six states, suggests patients should be pushy about getting follow-up care so they don’t have to return to crowded emergency departments. It’s also a reminder of how disconnected our health care system is. Chances are, your primary care doctor won’t know you made an ER visit unless you call about what to do next. And if your second visit was to a different ER, often doctors can’t see your earlier X-rays or other tests and have to repeat them. While more hospitals and doctors’ offices are trying to share electronic medical records, it’s still far from common. “It’s frustrating. We’re open 24 hours a day and we don’t necessarily have access to those records,” said UCSF assistant professor Dr. Reena Duseja. Duseja’s team analyzed records from Arizona, California, Florida, Nebraska, Utah and Hawaii, among the first states to link records so patients can be tracked from one health facility to another. Researchers checked more than 53 million ER visits in which the patient was treated and sent home between 2006 and 2010. About 8 percent of patients returned within three days, and 1 in 5 made a repeat visit over the next month, Duseja reported this month in Annals of Internal Medicine. A third of revisits within three days, and 28 percent over a month, occurred at a different ER. Duseja couldn’t tell why – if patients were dissatisfied the first time, or traveling, or for some other reason. Patients with skin infections were most likely to return, followed by those with abdominal pain. State rates varied a bit, with 6.2 percent of Arizona patients returning within three days compared with 9.3 percent in Utah. Revisits may be appropriate, Duseja said. Nearly 30 percent of revisits involved hospitalization, suggesting either patients got worse or emergency physicians felt more scrutiny or testing was warranted. Also, sometimes ERs tell patients to return. 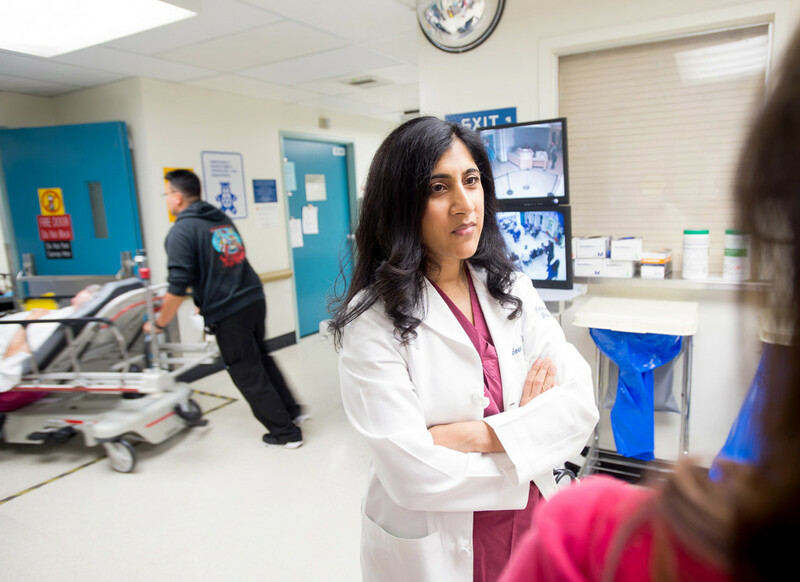 In the ER at San Francisco General Hospital, Duseja sees many Medicaid or uninsured patients who have trouble finding a primary care doctor or specialist. Were you interviewed for this story? If so, please fill out our accuracy form.